Multipurpose platform for all of your extra gear. Do you have a GoPro, rod holder, GPS, fish finder or a smartphone grip? All of that, you can mount easily on Uni-Bar. 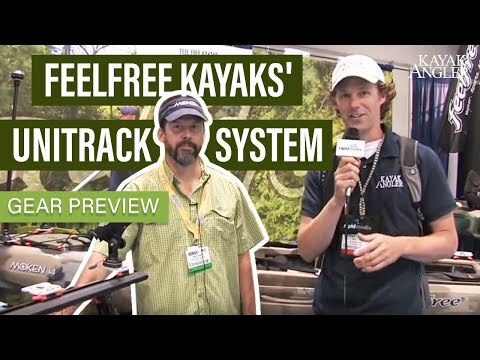 Turn the cockpit of your Feelfree kayak into a kayak fishing command center with the Feelfree Uni-Bar Deluxe system. This Feelfree exclusive accessory is designed to mount to your Uni-Track system to create an accessible dashboard for all of your electronics and other rigging accessories. Because it uses the Uni-Track system, the Uni-Bar easily slides backwards and forward. It also includes easy access lure hangers along with integrated ruler that measures up to 15”. The deluxe model includes three Uni-Track Plate Mounts. The Feelfree Uni-Bar Deluxe is compatible with all Feelfree kayaks that have the integrated Uni-Track system. For anglers who want to make the best of their fishing. Use Uni-Bar and Uni-Tracks to equip rod holders, fish finders, camera or GPS.